Midcentury Modern homes aren't all that typical in Louisville. It's not like Phoenix or Palm Springs around here - there's a great mix of Victorian, Craftsman, Cape Cods, etc... but Midcentury Moderns are few and far between. 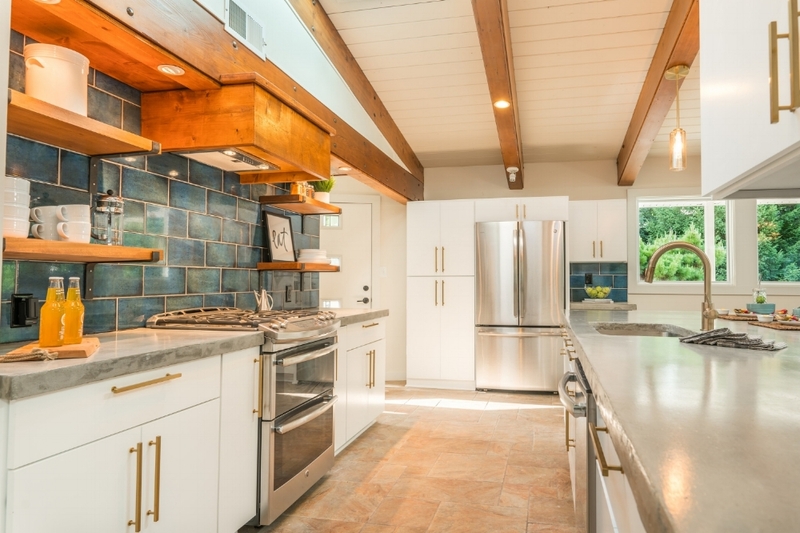 So, when we bought our Dorsey flip which was a textbook Midcentury Modern hidden under many years of other design eras' renovations... we had our work cut out for us. In order to do this house right, we had to do a lot of research into MCM characteristics, design signatures, etc. in order to be able to keep the original character of the home - which was of utmost importance to us - while still updating it to be appealing to today's buyers, and have the features that are appropriate for a home in this area and price range. One of the most important pieces of a renovation (and maybe the most fun for me) is kitchens. I LOVE DESIGNING KITCHENS. Maybe it's because I love to cook and am really good at it, maybe it's because it means I get to shop for (read: play with) a bunch of pretty things. Whichever one it is, I was especially excited for this kitchen because I was going to get to go more modern than our recent projects. Let's start with the some "before" pictures of this kitchen. If you can look past the aesthetics (SO MUCH BROWN), there were actually some really good things about this kitchen when we bought the house - by far not the worst we've tackled. First and foremost, the kitchen was already open to the dining and living area. One of the #1 things on most buyers' wish lists is an "open concept" eating and living space - and this house already had it. SCORE!!! Secondly, even though the galley layout isn't my go-to kitchen floorplan, it actually worked here - which meant we could leave the sink and dishwasher plumbing and range plug and gas line in the same place. SCORE AGAIN - that's less time and money we would have to spend moving plumbing and electric, even more essential in this house because it's built on a slab and moving those things would be $$$$. Lastly, with some rework of the back wall (we'll get to that in a minute) - there could actually be a lot of counter and storage space in this kitchen. All good things, and a great starting point for us. Hands down, the first priority was de-cluttering the back wall, the one with the range. It felt way too cramped but more importantly, lacked function. Due to the enclosed area around the range and how small the enclosure was - there wasn't even enough counter space to sit a normal-sized dinner plate on the counter between the range and the "wall". Got a plate of chicken ready to put in a pan? Sorry, better put it somewhere else. Cutting board of veggies? Definitely not. Also, I'm short (5'5") and standing at the stove just felt... claustrophobic to me. I can't imagine how a tall person would feel. Also, having the fridge on that back wall meant there was even less counter space available - and we're guessing that the buyers of a 4000 sq ft house in this price range are either going to have kids or love to entertain (or both), making counter space a necessity. Second priority was mostly functional: Removing the higher level of the peninsula to make the peninsula all one level. Yes, there was a counter on the other side that theoretically someone could sit at - but it was so narrow, a normal-sized plate wouldn't even fit on it, let alone a full place setting. About all you could set there was a drink. Not functional for casual eating. Also, having the higher level meant it blocked the view of the kitchen a bit. Some people may like this (helps hide the dirty dishes) but I personally thought that a single-level peninsula would look better in this home. Update the design to be more cohesive with the Midcentury Modern style of the home. While natural wood elements are a signature design characteristic of MCM, it's usually teak wood - not cherry, which is the color cabinets that the house came with. And cabinets with arches on the doors are definitely not fitting for MCM. What we were shooting for was bringing back MCM design elements like flat-front cabinets, clean, angular lines as opposed to curved, and a bold color somewhere. Remove all upper cabinetry and range "surround" from the back wall of the kitchen to make room for only open shelving on the back wall. Move the fridge to the right-hand wall, where the wooden bar top is. This involved removing the two exterior windows and framing them in - in this case, no big deal since that side of the house was plain white vinyl siding - very easy to match. We were also able to reuse the windows. Remove the higher level of the peninsula - take layers of bricks off to allow for a single-level peninsula. Order new cabinetry. We were originally hoping to just replace the doors on the cabinets and just paint the boxes (save some $$$), but the cost savings were minimal once all factors were considered. We used the same floorplan for the lower cabinets, and we added a stand-up pantry on one side of the new fridge location (adding storage to balance the loss of upper cabinets from the range wall), and an upper and lower cabinet to the right of the fridge. We thought this would be a great "coffee bar" out of the main traffic flow of the kitchen. Please enjoy my Paint drawings to help visualize numbers 1-4 above. LOLOL. So, after some demo and selling the old appliances (which were still in good shape) via a Facebook yard sale group, we set to putting things back together! We selected to do concrete counters because a) I've been dying to try it and never had the right house for it before; b) granite wouldn't work in this house, too much movement to fit the MCM aesthetic and it would have been REALLY hard to find one to match the tile that came in the house; c) it was less expensive than quartz, which was our (slightly safer) other option. AND OMG I AM IN LOVE WITH THE CONCRETE COUNTERS. They looked perfect in this house. Definitely not for everyone, or every house, but that's okay because it worked here. You guys. There's like 1942 decisions that these pictures don't show. It's not as simple and quick as choosing your layout, ordering your materials, and giving your contractor the cabinet layout. Things like what do we do with that vent in the beams? Exactly how wide and deep do the shelves need to be to have enough storage yet still be proportional to the wall? What is the design for the box around the range vent? 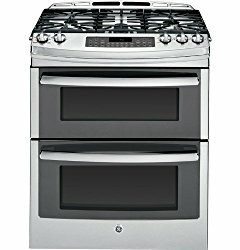 Is the range all gas or gas + electric? Will there be a disposal? What pattern do you want your backsplash tile laid in? Where do you want your handles installed? What finish/color stain on the concrete? True story, I made the electrician change the plugs in the backsplash from white to black because white stuck out too much. Also, we almost forgot to run a water line to the new fridge location for the icemaker. Thankfully someone caught it before it was too late. But in the end, it looks like THIS. This is one of my top two favorite kitchens I have ever done. I got to use different materials that I had never played with before, I went BOLD on a backsplash, and I did open shelving for the first time! You can see more photos of our Dorsey renovation over here. Cheers y'all! Get the look! Click on any of the images below to view the exact products we used in this renovation. Disclaimer: Some may be affiliate links. If a product isn't linked, it's most likely either custom or it's staging that belongs to our stager and we don't know the source. As always, feel free to email us with any other questions.